A worldwide outbreak of mass hysteria and murder is linked to the use of a popular social networking website. Kindred College student Sam and her boyfriend Dan Hamilton break up over video chat on the popular social media website www.thesocialredroom.com. Sam prepares for a New Year’s Eve party with Mark Archibald, who she has also been seeing on the side. Spending the evening with them are their friends Chad Wilson, Jed Erickson, Steve McDonald, and Steve’s girlfriend Kaitlin Cosgrove. As their night progresses, the group learns from television news breaks and online reports from other friends that people are being murdered and losing their minds all over the world. Symptoms that someone is infected include hallucinations and nose bleeds. It is ultimately revealed that the source of the hysteria is The Social Redroom. A program installed to deliver subliminal messages for its users to frequent the site more often triggered mass psychosis. As the friends begin dying one by one, Jed uncovers an online video from a doctor claiming that the infection can be reversed by performing a brain operation. With a drill, Mark prepares to perform the operation on Sam after they are the only two friends left standing. However, Chad unexpectedly returns to the house and kills Mark. Sam then performs the operation on herself. As she recovers from the hole in her head the following morning, news reports circulate that the infected humans who died or were murdered are reanimating everywhere. While her dead friends begin returning to life as zombies, Sam arms herself with an axe and takes to the streets. “Psycho” has close to the same effect on modern viewers as it did in 1960 thanks to a timeless story that still holds up under fresh eyes. “Antisocial” also has a timeless plot, but its Facebook-centric theme is unlikely to see longevity read in its tealeaves, even if it is timely today. “Antisocial” has a perfectly positioned soapbox to preach the dangers of a technology-obsessed society conditioned to watch their own lives through a cell phone camera lens. This is a film set during a time when it is widely accepted behavior to carry on two distracted conversations at once, one of which is via typed text on a mobile device in the palm of a hand. But instead of capitalizing on clever social commentary, “Antisocial” turns out to be another zombie invasion rehash wearing a slightly trendier skin. “The Social Redroom,” which is this movie’s surrogate Facebook, has figuratively infected the lives of everyone in the world to such a degree that the sickness turns literal, mutating addicted users into bloodthirsty savages. Initially intended to instill a desire to post more pictures and connect online more often, a subliminal program gone haywire is a slick explanation for the global outbreak. It is also the full extent to which the social networking premise of the film applies. 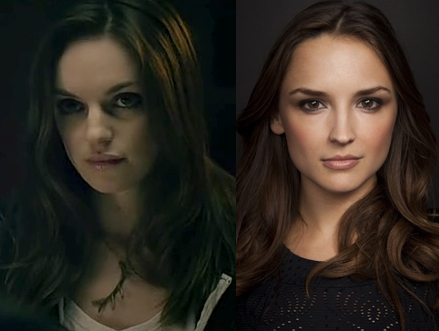 Michelle Mylett of "Antisocial" and Rachael Leigh Cook: Separated at birth? The media tech catalyst for this pandemic, which is what should set “Antisocial” apart as unique in the genre, is woefully underutilized. Overuse of Facebook is interchangeable with any other explanation for an undead uprising. Replace the online addiction with a reality television obsession, consumption of a particular food, poison cloud, or plain old contaminated drinking water and nothing about the script or its delivery would change. 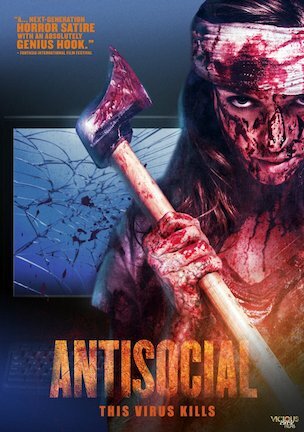 With its key hook relegated to a nearly negligible supporting role, “Antisocial” exposes itself as a routine apocalypse fantasy, and not a memorable one at that. Regurgitating pieces of other horror films is acceptable when done with personalized style, a wink, or a hat tip. When all of those previous movies have done it better, simply reheating leftovers just leaves a bland taste in the mouth. As the half dozen university students barricading themselves against the madness outside begin exhibiting symptoms, they pointlessly cycle through the pat rigmarole of trying to convince everyone that they are fine. In response to infection signs shown by own friend, his disbelieving buddy stupidly asks, “how do we know it’s the same thing…?” “I’m not sick” and “I’m ok” come from the mouths of others characters in denial. “Antisocial” has a chance to emulate the psychological hysteria of “The Crazies” but it is comfortable in the skin of a scaled down “28 Days Later” with straightforward slasher flavor. Playing tamely with an isolated tale, “Antisocial” would never be asked to come in off the bench when superior living dead heavyweights are already on the field. “Antisocial” misses the very opportunity it creates for itself by choosing to bite weakly as typical Armageddon terror instead of fiercely as savvy social media satire. January 4, 2014 by Ian Sedensky.